FILE - President Barack Obama gestures as he answers question from members of the media during a news conference in the State Dining Room of the White House in Washington, Oct. 2, 2015. The United States is the world's largest jailer. U.S. President Barack Obama said Saturday in his weekly address that he is encouraged by congressional efforts and other endeavors to change the fact that while the U.S. is home to five percent of the world's population, it has 25 percent of the world's prisoners. The president said, "Every year, we spend $80 billion to keep people locked up." Obama said the "real reason" for the soaring prison population is over the last few decades, the U.S. had "locked up more non-violent offenders than ever before, for longer than ever before." He said "in too many cases, our criminal justice system is a pipeline from underfunded schools to overcrowded jails." The president said he has taken steps to reverse that trend by investing in schools that at-risk youths attend, signing a bill reducing the 100 to 1 sentencing disparity between crack and powder cocaine, and commuting the sentence of dozens of people "sentenced under old drug laws we now recognize were unfair." President Obama said he will travel around the country over the next few weeks "to highlight some of the Americans who are doing their part to fix our criminal justice system." His itinerary will include a visit to a community battling prescription drug and heroin abuse, and talks with law enforcement leaders "determined to lower the crime rate and the incarceration rate." The president is also scheduled to meet with former prisoners. Earlier this year, Obama became the first sitting U.S. president to visit a federal prison, as part of his push for a fairer justice system and prison reform. 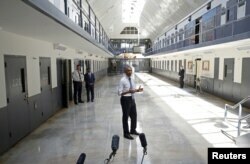 He met with both law enforcement officials and inmates at the El Reno prison in the central U.S. state of Oklahoma. U.S. President Barack Obama, the first sitting president to visit a federal prison, speaks during his visit to the El Reno Federal Correctional Institution outside Oklahoma City, July 16, 2015. Obama said in his weekly address he was encouraged by the bipartisan effort in the Senate earlier this month, resulting in an agreement on a criminal justice reform bill. The president said the bill would reduce mandatory minimums for non-violent drug offenders and reward prisoners with shorter sentences, if they complete programs that make them less likely to commit a repeat offense. The harsh sentences were handed down in an era when a "tough on crime" stance resulted in the prison population surge. The mandatory minimums were joined by a law called "three strikes, you're out" which mandated life sentences without parole for a third felony involving drugs. New Jersey Senator Cory Booker said recently that the Senate bill is "a moment where, after decades of our country moving in the wrong direction, after decades of seeing our federal prison population explode 800 percent, we have gotten our criminal justice system — with this piece of legislation — moving this country forward." The House of Representatives is also working on a criminal justice reform bill. "From the halls of Congress to the classrooms in our schools, we pledge allegiance to one nation under God with liberty and justice for all," President Obama said Saturday. "Justice means that every child deserves a chance to grow up safe and secure, without the threat of violence. Justice means that the punishment should fit the crime. And justice means allowing our fellow Americans who have made mistakes to pay their debt to society, and re-join their community as active, rehabilitated citizens." Obama said "Justice has never been easy to achieve, but it's always been worth fighting for. And it's something I'll keep fighting for as long as I serve as your president."